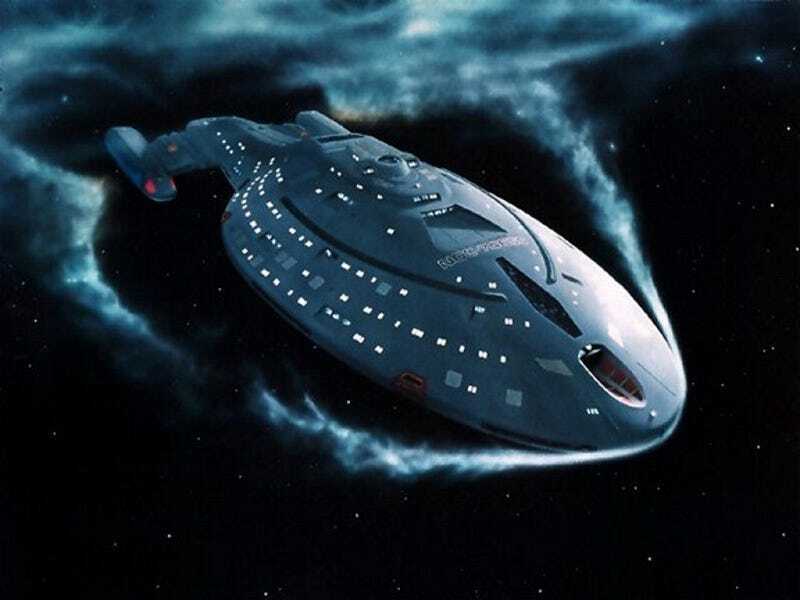 Twenty years ago today, Star Trek: Voyager premiered. Of the five live-action Star Trek series, Voyager is not the best. If you were ranking them, Voyager and Enterprise would probably duke it out for last place. But none of that matters, because Star Trek: Voyager meant everything to me as a child. I didn't actually see Voyager premiere twenty years ago. I was too young to have found it on my own. Hell, I was young enough that I'd only just started reading chapter books. It was halfway through the series, in season four, that I became an active watcher. I have an insanely vivid memory of the first time I got into Star Trek as a child. We had gone over to my grandparents' house for dinner, and I had escaped the adults by going into the guest room and watching whatever I could get on the old television in there. And what I caught were some reruns of Star Trek: Deep Space Nine and Voyager. And I can tell you exactly why it wasn't Deep Space Nine that caught my attention: The episode was "Inquisition," which has a plot involving the Dominion War, Section 31, and Julian Bashir's background. You cannot start watching a show with that episode. Especially when you're ten. Voyager, on the other hand, showed me an episode that didn't require that much background information. It was brighter and more episodic. And it had a female captain. It is impossible to overstate how important it was for me to see that. I wanted to be Captain Janeway more than I've ever wanted to be any character. It was, hilariously enough considering this was a show that takes place in the future on a spaceship, the most attainable position of female leadership I'd ever seen. I think it was because Star Trek never made a point — in the show, I know it was mentioned in the press around the show but, again, I was ten – of her gender. Yes, it was briefly alluded to in the pilot, but they didn't dwell endlessly on it. Why would it? This was Star Trek at its most optimistic. Anyone good enough could be a Starfleet captain. Anyone smart enough. You didn't need to be a supermodel or an action hero to climb through the ranks. I loved Star Wars, but there is a strong element in both the original trilogy and a lot of the EU books of people being born into their abilities and roles. That was noticeably absent in Voyager. Star Trek, in all its incarnations, is not a "chosen one" narrative. And Kathryn Janeway was a scientist, remember? We'd always been told that Starfleet wasn't a military organization, but its structure made that kind of hard to believe. Our main captains had always been strategy-obsessed. Even if Picard had an interest in archeology, what he was famous for was a tactical maneuver. I couldn't see myself in that kind of role, but a scientist? Yes. And for a nerdy and unpopular girl, that was a revolutionary thing to see. The "seeing yourself on screen" thing is a cliché, but it really is important. It's not just seeing people you can relate to, it's seeing people you can relate to being successful. That's the empowering part. That's what Star Trek: Voyager meant to me. And that's not all it meant to me. Everything I know about being an engaged fan, I learned from Star Trek: Voyager. That show wasn't the first thing I had been a fan of, by any means. I'm pretty sure The Chronicles of Narnia as a kindergartner take that honor. But it was my first fandom. As a latecomer in the age before DVRs, streaming, and even box-set DVDs, each night was spent with a TV Guide looking up the syndication airings of Star Trek episodes and setting the tape recorder. Episodes I liked were kept on tape. In my childhood bedroom there's probably still dozens of VHS tapes, labeled with every episode I'd recorded and saved. I was anxious to see everything I'd missed. As a Janeway/Chakotay shipper, the episode "Resolutions" was my white whale. I wanted to see it more than anything. Funny that it kind of makes me cringe to watch now. I bought a color-blocked sweater in red and black that kind of looked like a Starfleet uniform and put a pin on it, so I could I pretend it was a combadge. My local video store had The Original Series and The Next Generation on VHS – I worked my way through them all. On a family trip to Las Vegas, I dragged my family to the Star Trek experience and came home with an armful of Tribbles. In elementary school, I had three friends. Three. And all of them were prettier, smarter, and richer than I was. None of them wanted to read Star Wars novels or watch Star Trek. I always just had to enjoy my nerdy pursuits on my own. But then a cursory Internet search of my new obsession brought me all these other people. Voyager was my first introduction to every aspect of fan culture. My first fanfic. My first ship. My first shipping war. My first fandom friends. And, man, did Voyager fans deliver a dose of welcoming and belonging that I had no idea I needed so badly. I e-mailed a fic writer just to say I liked the story, and would it ever be finished? (It was a Star Trek/Star Wars crossover and had Janeway/Chakotay as a ship. May as well bare all the embarrassing bits of my childhood at once.) She was enthusiastically kind, and invited me to join her J/C Yahoo! Group. One specifically aimed at people under 18. This could have gone very wrong. I'm so lucky that, instead, it was a fabulous experience. The group exchanged e-mails on a nearly daily basis. We discussed new episodes and debated everything. Except for Neelix, whom we all universally hated. All these other people, all of whom were my roughly my age, from all over the place, proved to me very early on that there wasn't anything wrong with liking the things I liked, even if no one at my school was on board. I never met any of them in person and, as the show ended, we drifted apart. But that was my first ever experience in fandom, and while I was a lurker for the rest of my youth, it would always color how I saw fans. Like Star Trek itself, this fellowship was an ideal to aspire to. There are other parts to this story. There are the books I read because they were referenced by Star Trek. There is the fact that my father revealed himself to me as a Star Trek fan once I became one, and we watched Enterprise together when it premiered. There is my name, which I embraced more fully in an attempt to emulate Kathryn Janeway. There are all these things that happened because of Star Trek: Voyager. These days, as an adult, when I watch Star Trek: Voyager, I can see all of the show's flaws. It's not the Star Trek series I'd recommend to newcomers to the franchise. Captain Janeway isn't even my favorite Star Trek character anymore. But that in no way diminishes the revolutionary impact the show had on me, and how much the U.S.S. Voyager was there for me when I needed it most.